This illustration shows the essential feature of electrostatic attraction between similar charged colloidal particles with H+ as counterion, which is discussed by Norio Ise in his article [Proc. 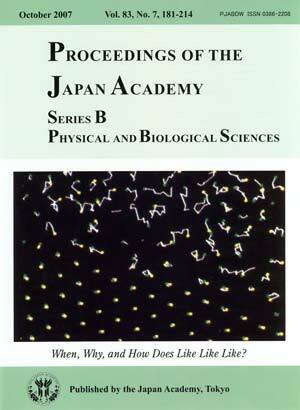 Japan Acad. 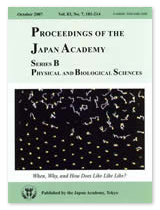 Ser.B 83,192, (2007)] “When, Why, and How Does Like Like Like? Electorostatic Attraction between Similarly Charged Species”. The motion of latex particles, which are large enough to be seen under microscope, is followed by a video device. The particle centers in 11/15 s, which are stored in an image data analyzer, are demonstrated in a new frame and connected with lines. The particle centers at a starting time are shown in green and that after 11/15 s in yellow. The white lines without either green or yellow end or both indicate the 3-dimensional (out-of-focus plane) movements. The interparticle spacing is about 1×10-6m in the ordered region (lower part), in which the particles show lattice vibration. The particle in the disordered region show random motion, which can approximately be described by the Einstein theory of Brownian motion. Though not clear from the picture, particles in the boundary region between the crystalline and gas structures evaporate into the gas regions and condense into crystalline region, indicating that there is no stable mechanical interface between the two regions. The fact, that the crystalline region of a high particle density coexists with the gas region of a low density with such a free interface, indicates that the existing theory of colloidal interaction fails and particles, though similarly charged, attract each other. This picture therefore illustrates the existence of attractive force between similar charged particles. The picture was prepared by Professor Kensaku Ito, Toyama University, and taken from an article in Journal of the American Chemical Society [110, 6955 (1988)] with the permission of the American Chemical Society, and the caption was written by Hiroo Inokuchi, Member of the Japan Academy.